So the basic question that I would like to discuss here is whether what you see in the eyepiece or on the computer screen is really the sky object you are or were looking for. Depending on whether I am observing purely visually or taking photos of the sky objects, I take different routes in order to answer this question. When I observe deep sky objects "visually," it often happens that I see nothing at all, just a faint glimmer, or only a few scattered stars. 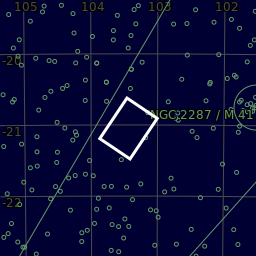 So is this shimmer the object that you are looking for or are the "few stars" the star cluster that you are looking for? When I approached the objects "manually," I can also ask myself whether I have even looked in the right place. 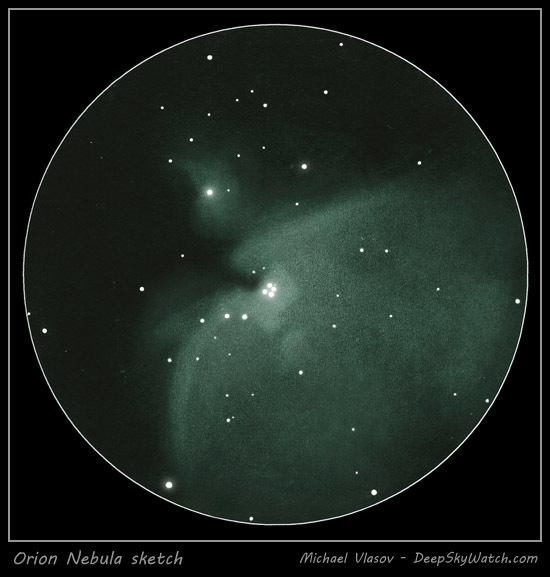 But often I am sure that the telescope points to the right position in the sky, and if I do not see anything then the conditions are probably too poor for a find... And when I see "something," this is almost certainly the object I am looking for. And how this object might look like under better conditions can be found in books or on the Internet. But more about this later! For purely visual observation, I more or less rely on the assumption that I have actually found the object when I saw something in the eyepiece. I think that this is okay, especially if the object was not too difficult to find. When photographing sky objects with the Atik Infinity camera, however, the situation is somewhat different. First of all, I want to address the successful finds! Unlike visual observations, photography provides a result that can be easily compared with photos or sketches from books or the Internet. My preferred sources are described below. In addition, the camera delivers a result that is more similar to that of other cameras than to the visual impression. Therefore, comparing photos with photos is usually preferable to comparing them with drawings, which usually correspond to the visual impression. But I often use both to see how the individual representations differ and complement each other. Now let me turn to the "not so successful finds"! 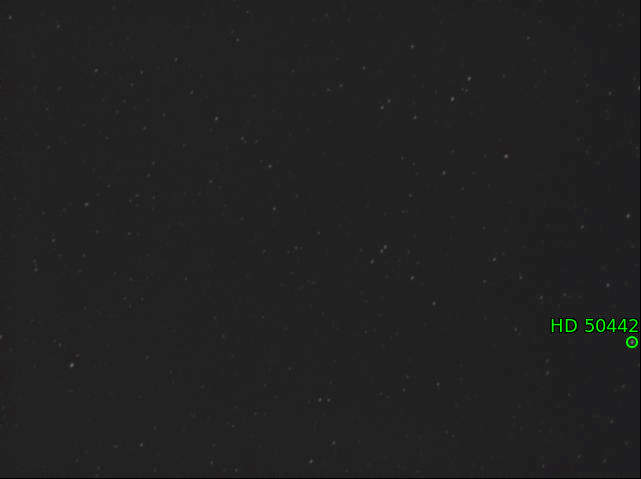 Even with the StarSense module, the GoTo control unfortunately does not always find the right target, which is certainly also due to the small image section of the Atik Infinity camera. Sometimes, I still manage to "capture" the desired object, especially if its appearance is characteristic. In other cases, namely open star clusters, which are of particular interest here, I see, thanks to the high sensitivity of the camera, a more or less distinct "cluster of stars" and then try to capture the area with the "highest star concentration" in the hope that this is the sought-after open star cluster. The photos look quite satisfactory at first... But when I compare my photos with photos or drawings from books or the Internet, I can unfortunately not find a match in some of them. Obviously I had photographed something completely different than intended - but what? Initially, I had the obvious idea to use astronomy programs to search the surroundings of the "unknown objects" for matching patterns. But so far my experiences with these programs have been such that I was hardly able to establish a relationship between what the camera photographed and what the programs show. In other words, the programs do not help me in my search. So I looked for other solutions. And that is when I came up with the term "plate solving," which stands for algorithms that can recognize which part of the sky a camera or a photo shows. I had already stumbled across this term in connection with the eVscope, but had not pursued this topic any further, particularly since I did not see any practical use in it for me. But after so many failures in photographing open star clusters, plate solving appeared to me as a viable approach way to find out what the camera actually photographed. This impression was also confirmed when I came across the website of Dietrich Kracht, who describes this method and programs in detail (in German). More about this below! For comparing my observations or photos with photos or drawings of the corresponding sky objects I consult the sources described below. 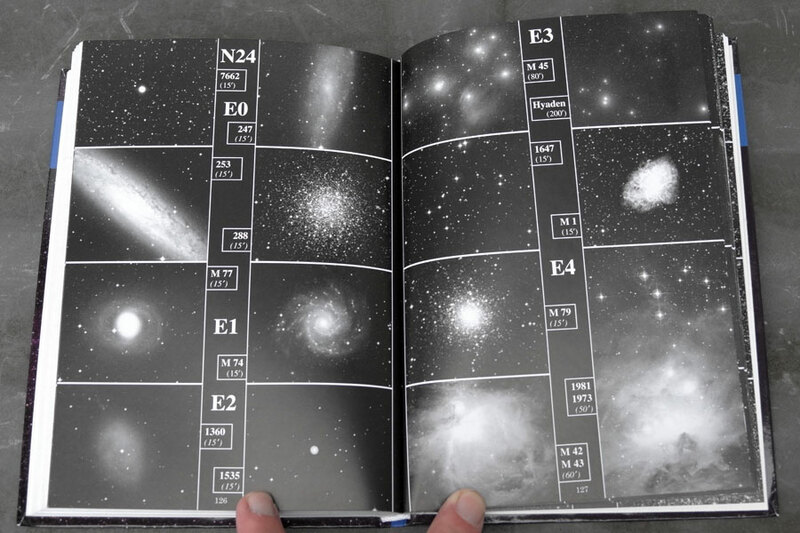 Unter "Plate Solving" versteht man eigentlich nur die Funktion, dass eine Software einem sagt, was auf einem Astrofoto eigentlich zu sehen ist; also welche Sterne und sonstige Objekte (DSO) mit ihren Koordinaten (R.A. und Dekl.). Das Solving ermittelt immer die Koordinaten des Bildmittelpunkts, den Drehwinkel und weitere Daten; sehr nützlich wäre es, wenn zusätzlich noch die Sterne und DSOs mit ihren Namen beschriftet würden. Ein wesentlicher Unterschied bei Plate-Solving-Lösungen ist, ob man einen ungefähren Anfangspunkt für das Solving angeben muss oder nicht. Wenn nicht, spricht man vom sog. "Blind Solving"; was natürlich einfacher zu handhaben ist – wenn es trotzdem schnell genug ist. Ein weiterer Unterschied bei Plate-Solving-Lösungen ist, ob das Plate Solving im Nachhinein (Stunden oder Tage nach der Aufnahmes des Bildes) oder "near real time" möglich ist; z.B. kann etwa das Programm APT ein Bild aufnehmen (mit verbundener Kamera), dieses sofort "Plate Solven" und dann der per ASCOM verbundenen Montierung sofort GoTo-Befehle schicken, um ein Objekt zu zentrieren etc. etc. Bestimmung welche Sterne, DSOs etc. sind auf meinem Bild; optional mit entsprechender Beschriftung des Bildes. Messung der Genauigkeit einer Bildpositionierung (Pointing) z.B. einer GoTo-Montierung. Messung der Genauigkeit einer Nachführung (Zeitreihe bei laufender Nachführung). 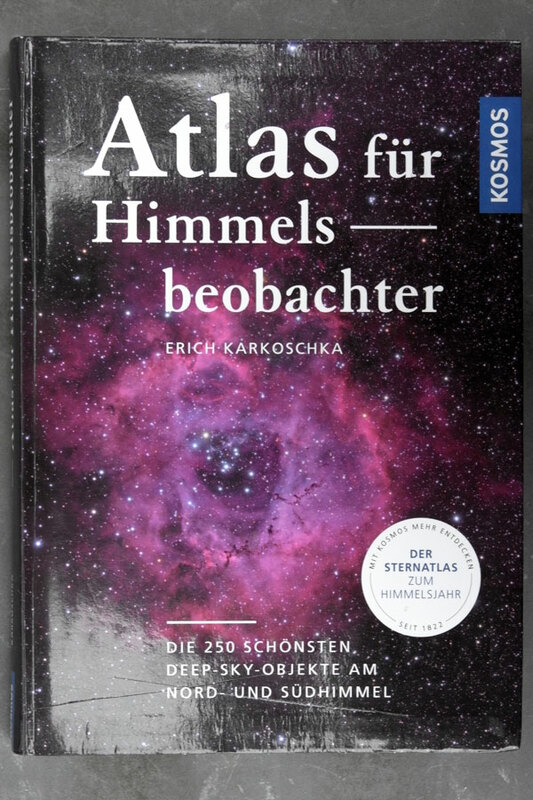 Wenn es gelungen ist, die Sterne auf einem Astrofoto zu identifiziern, wäre eine nächste Frage etwa die Frage nach der Grenzgröße. Plate Solving Software kann entweder "stand alone" (also ganz alleine ohne eine weitere Software) oder "eingebaut" von einer anderen (führenden), sog. Host-Software aufgerufen werden (z.B. von APT aus oder von SGP aus). Im einfachsten Fall, dem "stand alone" Plate Solving können die Bildquellen ganz einfach JPG-Bilder oder FITS-Bilder sein, die irgendwo auf dem Notebook liegen (also keine Kamera, kein ASCOM, kein gar nichts, eben einfach "stand alone"). Als Ergebnis des Solvens werden die Koordinaten des Bildmittelpunkts, der Drehwinkel und einige weitere Daten ermittelt. Dietrich Kracht's Website contains much more information about plate solving and the applications he uses. In particular, I first came across his description of the program All Sky Plate Solver by Giovanni Benintende. This has enabled me to get along with this application relatively fast. Now I extracted the coordinates to which the camera pointed, but I do not really know more by now. In the "Browse" window deep sky objects are indicated, but if you aimed next to them, thias feature does not help much, because the corresponding object is not on the photo at all. So I tried out my astronomy programs, and checked which one would offer the easiest way for reaching my goal. Much to my surprise, Stellarium won! 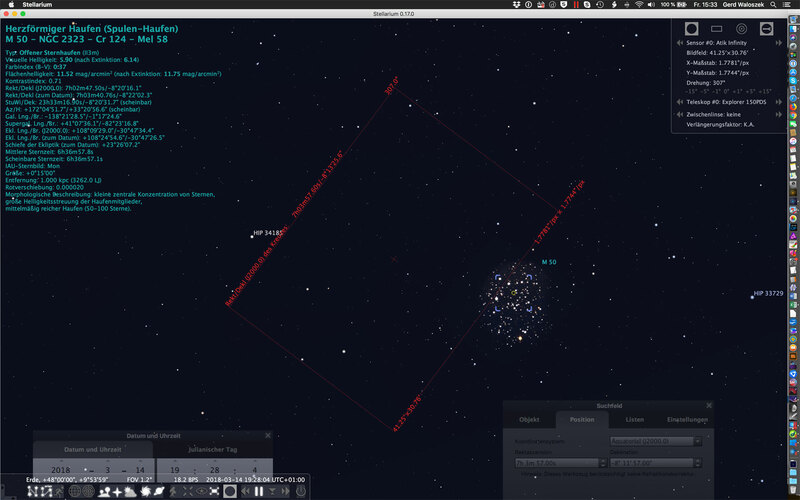 I now use the data for R.A. and Dec. (J2000) in Stellarium to find out what my Atik Infinity camera actually had photographed - or how much I missed the target. 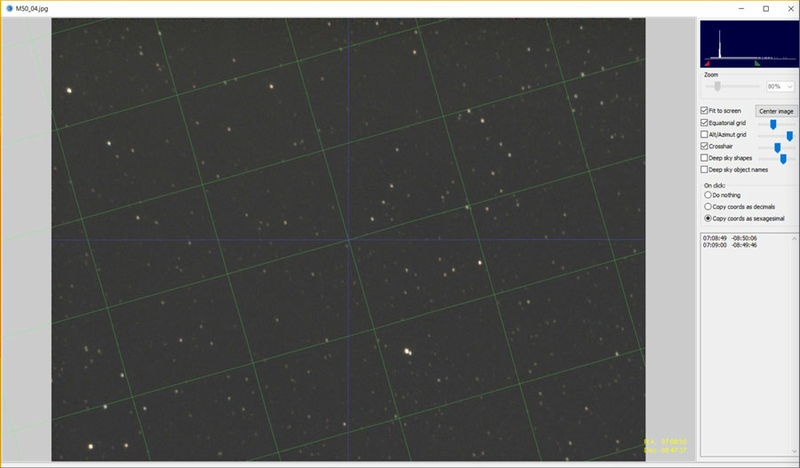 Before that, I entered the data of the camera sensor and the telescope into Stellarium so that I can now display the field of view of the camera. At my first attempts, I forgot to enter the rotation angle, but this is not that important, because I just want to know how much the GoTo control went wrong. I am also not quite sure whether I enter the rotation angle correctly (see below). 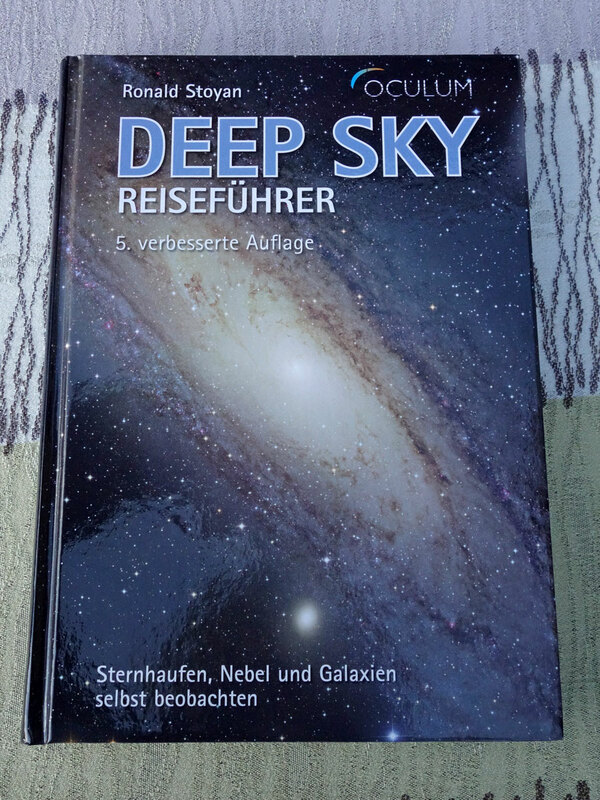 Mit den Daten für R.A. und Dec. (J2000) bin ich dann also ins Programm Stellarium gegangen, um herauszufinden, was meine Atik Infinity tatsächlich fotografiert bzw. wie weit sie danbeben gezielt hat. 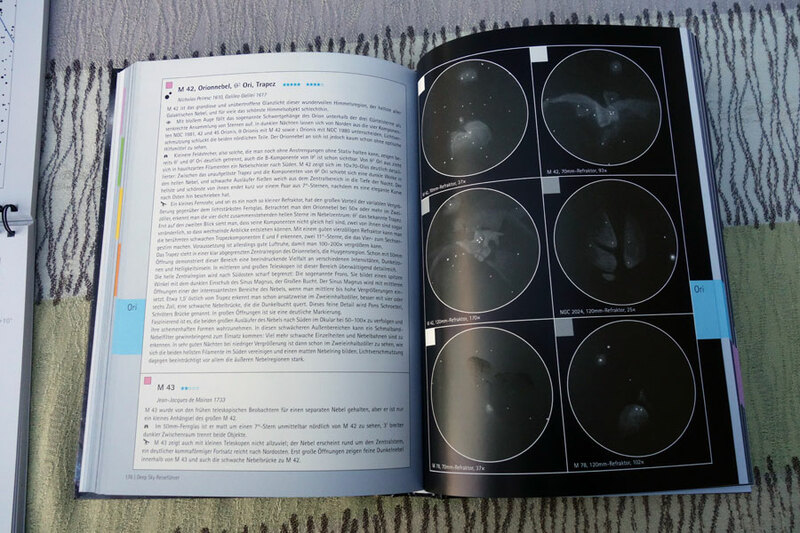 Dazu habe ich die Daten des Kamera-Sensors und des Teleskops in Stellarium eingegeben und kann mir nun das Gesichtsfeld der Kamera anzeigen lassen. Anfangs hatte ich vergessen, den Rotationswinkel einzugeben, aber so wichtig ist das nicht, denn ich möchte ja nur grob wissen, wie weit die GoTo-Steuerung daneben lag. Ganz sicher bin ich mir auch noch nicht, ob ich den Winkel korrekt eingebe (siehe weiter unten). 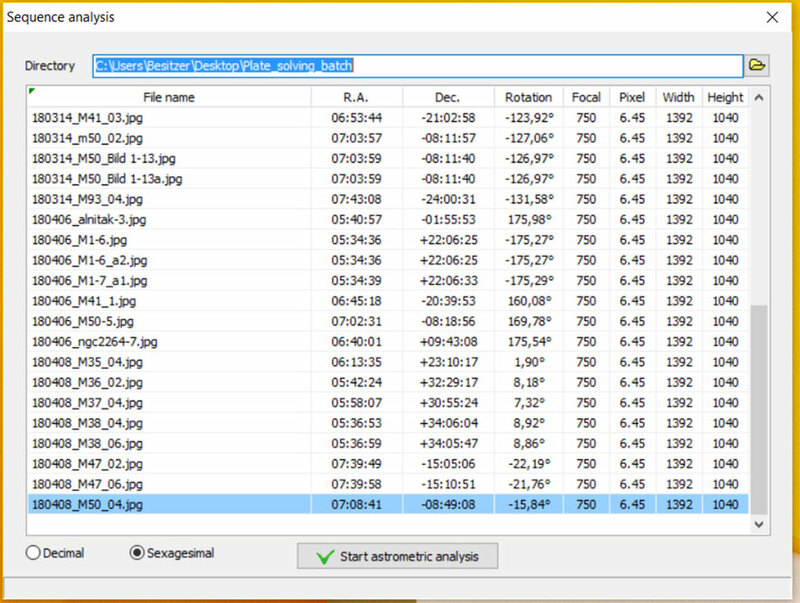 Nova Astrometry.net is an alternative to All Sky Plate Solver (instrcutions for Nova Astrometry.net by Dietrich Kracht, in German), if you are connected to the Internet (there also seems to be available a way to work offline using Windows). Here, too, one starts from photos, but these are uploaded to the Website and then then processed there. 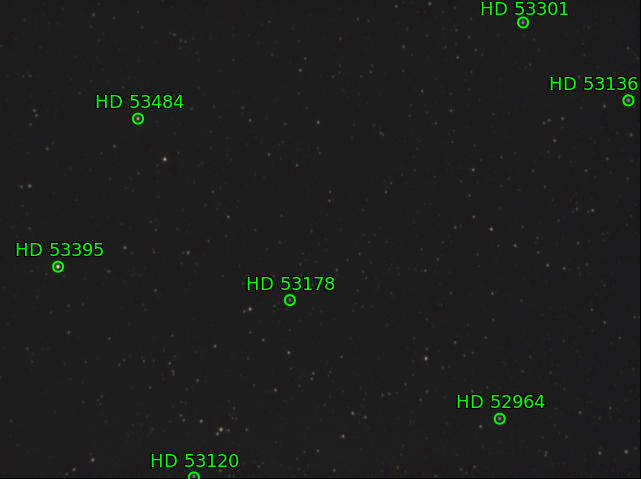 When I tried Nova Astrometry.net, I noticed that, at least when assessing the position in the sky, I was faster because you get sky maps right away. I have only compared a few photos with both methods so far, but the results seem to be identical or very similar. Only the angle of rotation makes me wonder and I ask myself what Nova Astrometry.net (or All Sky Plate Solver...) wants to tell me here. Center (RA, Dec): (103.437, -21.050), Center (RA, hms): 06h 53m 44.918s, Center (Dec, dms): -21° 02' 58.745"
Obviously, Nova Astrometry.net interprets the angle of rotation differently from All Sky Plate Solver (or me...). 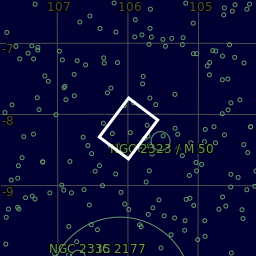 But when I enter the value of Nova Astrometry.net in Stellarium (304 degrees), I get the same orientation for the frame as shown on the Website. Here I entered the same rotation angle as in Astrometry.net (307 degrees) and was able to verify it using some stars. So I still have to think about what the angle of rotation indicated by All Sky Plate Solver means. Center (RA, Dec): (105.992, -8.200), Center (RA, hms): 07h 03m 58.084s, Center (Dec, dms): -08° 11' 58.634"
With All Sky Plate Solver/Stellarium and Nova Astrometry.net, thanks to the Website of Dietrich Kracht, I have found two solutions that make it quite easy to determine which part of the sky my Atik Infinity camera photographed. 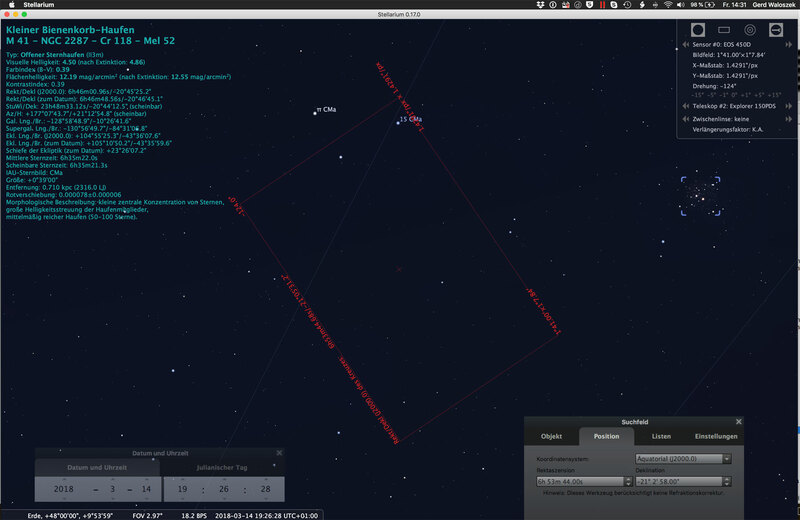 If it should be fast, I will probably use Nova Astrometry.net, because it saves me the detour via Stellarium (on the Mac) and via Windows. Now it is a matter of gaining some experience with both programs and hopefully also improving the alignment of the GoTo control! See also my page with Astronomy Links.